This limited edition offset print is an image rendered by Norman Rockwell entitled We, To, Have a Job to Do for the Boys Scouts of America. The image was used for their 1944 calendar illustration. 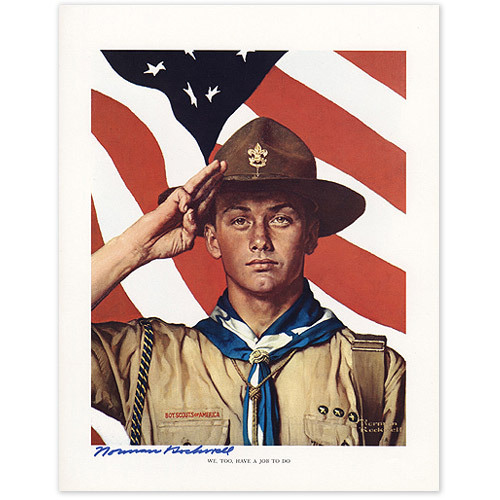 The depiction is that of a Scout pledging his allegiance to America, and the American Flag as a backdrop. The print has rich vibrant colors with a white border in excellent condition and has not been conserved. An outstanding feature of this print is in Norman Rockwell's eye for detail that engages the viewer. The print measures 14 X 11 inches and is hand signed by Norman Rockwell at the bottom in permanent marker.